After seeing so many movies, I have come to the conclusion that all biopics will follow the same pattern. It never seems any artist behind a camera has any new way of revitalizing this mini-genre. There seems to be no new beams of confidence, nothing else unique, no other way of telling this kind of a story. It seems, according to Hollywood, that biopics must follow the same template. Make a movie about an important figure, show them at his high time, show them struggling, then show them as they get back on top again. Yet, if I had to compare "The Theory of Everything" to anything, it would be "Walk The Line" from 2005. "Walk The Line" was a movie about Johnny Cash, while Stephen Hawking life is the basis for "The Theory of Everything." What makes these biopics so similar is how they use the women in these men's lives to push the story. It seems Johnny Cash would not have been the artist he was without June Carter, and likewise, Hawking could not have achieved what he wanted without the energy Jane offered him, no matter how brilliant his brain was. Both films do a really good job of bringing the lives of these individuals together, and strike a chord by finding the right actor to play these men. In my opinion though, I thought "Walk The Line" did it better. Much better. Eddie Redmayne plays Hawking, and Felicity Jones plays Jane Wilde. Throughout the entire film, we see how Hawking and Wilde came together, how they fell in love, how Jane still found love in Hawking even as his body began to deteriorate. At the same time, the movie still tries to juggle the origin of Hawking's magnificent work and how he became a world-redound intellectual. Everything passes so quickly and so at tentatively that many parts of the movie come off as bland. That is always the danger of making a biopic, how does an artist strive for making an emotional journey or just reenacting a checklist of an important figures greatest hits? What strings the movie back to life, is the journey between Jane and Stephen, that is where the movie gets its emotional heft. I can't say enough about Eddie Redmayne as Stephen Hawking. When Hawking himself stated that he thought he saw himself as he watched Redmayne portray him, well you can see where he is coming from. Redmayne completely becomes Hawking and he does a spectacularly good job transitioning how as Hawking's body gets weaker, his brain gets smarter. It is mesmerizing work by Redmayne and he will no doubt get an Oscar nod later this winter. Felicity Jones could very well get a nod as Jane, bringing unsuspected life to this strong woman. There is also superb supporting work done by David Thewliss, Charlie Cox, Emily Watson, Simon McBurney, and Maxine Peake. What I wish the film really did was dig deeper into the theories Hawking created. There was so much emphasis on the Stephen and Jane story that choked the life out of everything else. The other aspects of Hawking's life would have made for a more interesting movie. 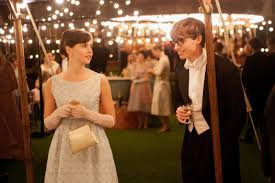 This movie should have been titled "Stephen and Jane" instead of "The Theory of Everything," since all of Hawking's work is punctuated by string-less scenes instead of emotional arcs. No matter what I say though, its tough not to recommend the film, simply to watch how incredible Redmayne is in the role.